As part of a continuing effort to improve efficiency and reduce emissions in transit buses, U of M researchers are conducting a study designed to help Metro Transit select the right bus for the right route. The research team, led by mechanical engineering professors David Kittelson and Will Northrop, is analyzing and comparing the performance of advanced hybrid buses, standard hybrid buses, and conventional diesel buses on three types of routes. 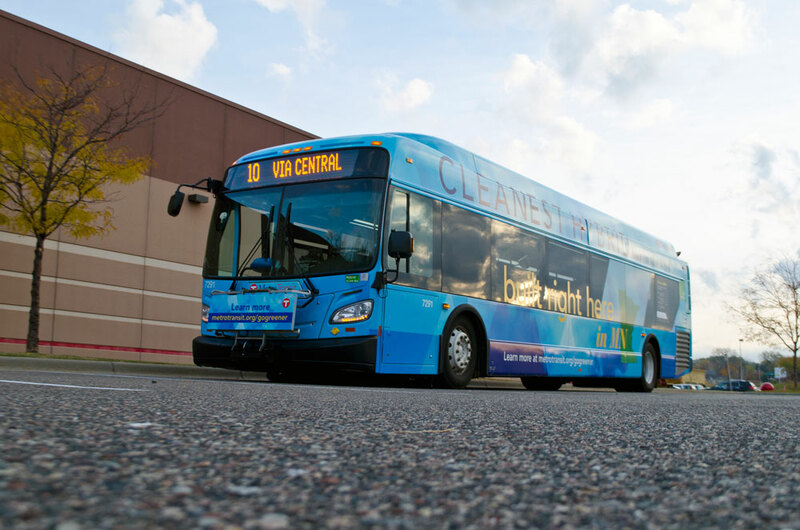 The advanced hybrid buses, equipped with all-electric accessory systems, were designed for Metro Transit based in part on a previous U of M study that explored how electric-powered accessories could significantly improve fuel efficiency. The ultimate goal is a modeling tool that considers factors such as route average speed, stops per mile, and climate in order to predict bus performance and emissions. The study, conducted in collaboration with Metro Transit, was funded by CTS and the U of M’s Institute for Renewable Energy and the Environment. To evaluate bus performance, the research team collected data on fuel efficiency and emissions. Initial findings indicate that the advanced hybrid has the largest fuel economy and carbon dioxide emissions advantage on low-speed routes that have many starts and stops. In particular, the advanced hybrid bus equipped with start/stop capabilities—which allows the engine to shut down at bus stops and traffic lights—has up to a 60 percent fuel savings. According Brian Lamb, Metro Transit general manager, the step-by-step progress being made through this research has already led to large fuel savings for Metro Transit—and agencies across the country. For example, findings from the U’s study on electric-powered accessory systems led to changes that are now used by the entire industry. Read the full article in the August Catalyst.